The solar water heater PIRSOL with copper collector has the form shown in the photograph and is available in 3 types. 1. The H120 (collector surface 2 m2), boiler 120 lt.
2. The H150 (collector surface 3 m2), boiler 150 lt.
3. The H200 (collector surface 4 m2), boiler 200 lt.
central heating system or with solar or electric power. 2. The Collector made of copper thickness - 12F. It is configured properly on both sides and connected in a way that allows water flow closed circuit. It is quite flexible in shrinkage and expansion. 3. Exterior fiber glass lining to insulate the boiler and make the material impervious to oxidation. The resistance to corrosion makes the boiler especially attractive for use in the coastal areas that so adversely impact other metals. 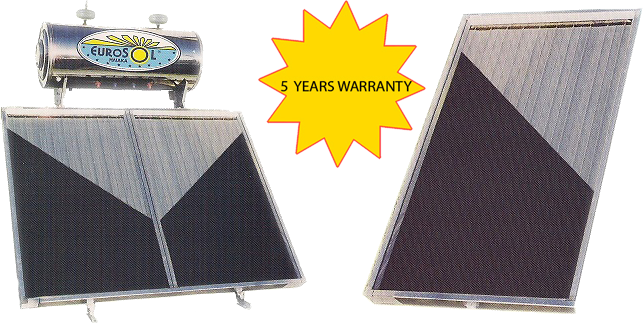 We supply all types of Solar boiler upon request.